Cadia Valley Newcrest noticed 2 stator coils on their 20Mw Siemens SAG Mill were vibrating during operation during a routine inspection. 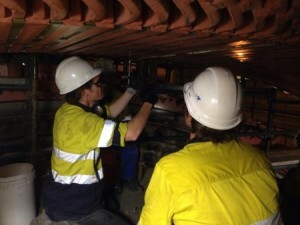 The mill was immediately shut down and Australian Winders promptly sent a winding specialist to site to inspect and give technical advice in con junction with Siemens to ascertain the best course of action. Australian Winders mobilised an additional 10 winders to site to work around the clock on 2 shifts. After the stator was moved into maintenance position a full inspection was conducted locating another two loose stator coils. A full wedge map found that 66% of the slot wedges were loose. The decision was made to conduct a full re-wedge and to clamp, re-pack and wedge the 4 loose stator coils. Australian Winders were asked to manufacture and supply over 3000 wedges and the ancillary wedging materials for the project. Within 5 business days all the materials were on site and from the removal of the first wedge, to the final HV test, the project took a total of 13 days. Well ahead of the estimated schedule, once again leaving site with a very happy customer.